Description of the game This will be an openish world campaign. I will be using the module “Heros of Thornwall” as a starting point, but will not be chained to it by any means. If the players walk a different road I will be happy to adjust as I go. Game thread can be found here Which will slowly be populated as I go. Background I would like to see creative and Imaginative backgrounds. Please include as much of the following as possible. Basically I want to know what kind of people your character would be friends with, who they are enemies with, ect. Be creative and take initiative. Feel free to create people, places, and things. I will be more than happy to write them into the campaign. I want fleshed out characters at the start of the campaign because one of your contacts might end up being a vital resource in game. Last edited by Master of Monsters; 12-28-2018 at 08:47 PM. This looks like a cool game, I'll start thinking up a character. Well, there's not much, but I like colouring in things, can we also spitball ideas about organisations outside of our characters? If you think that's an insane plan, we don't hang out enough. Last edited by Sirviantis; 12-28-2018 at 04:35 PM. So is this going to be set in the world of Aetaltis? or another world. Some basis would be nice, a major city or two. I am sorry, I forgot to mention this. I am still knocking the rust off of myself, and for that I am sorry. While I will be using the Heros of Thornwall for a basic outline, the campaign will take place in Fearun along the northern sword coast. Luskan in the north west, Waterdeep to the south west, The Moon wood for the north east and The High Woods for south east. We will focus in that rough square of the map, but could easily end up else where if the game heads that way. Basically I will be using the module as a first adventure option, and from there will start to flesh out with custom adventures and dungeons. Feel free to contact me with any ideas you might have and we can build from there. Last edited by Master of Monsters; 12-28-2018 at 05:26 PM. Any restriction on races, classes, number of traits, alignment, etc? Should we use Faerun deities if we go with a class that requires them? I am assuming that we should try to keep it to races that exist in the Faerun setting, or does that matter? Guns exist yet? I know they do in the setting, depending on the year. It happens, just wanted to see where we were going to be before starting to brainstorm concepts. Two traits will be allowed. Basics Appearance: Baron is slightly taller than a normal dwarf, at five feet tall, but weights almost a hundred pounds less, at about a hundred pounds. His head is mostly shaven save for a band the goes from the middle of his forehead back to the base of his skull and hangs slightly lower than his shoulders in a pony tail with bits of bone and beads woven tightly into the black mane. His beard is the standard size for a dwarf just becoming an adult, that is it hangs just above his pecks, and is also woven with bones and beads. His eyes are sunken into his head, a feature that's mostly hidden by his cloak, but are a grey almost soulless color and indeed many would say that Baron has no soul but a few have seen the true fire that blazes behind his eyes. Runic tattoos cover the bald parts of Barons head as well as his shoulders and arms, all in a dark blue grey ink. He wears a set of Lamellar armor most of the time, never know when the dead will rise he often says when asked why he wares it all the time. Over that he wears a black sheep skin cloak with a hood that shadows his face enough that you can't really make out his eyes, the cloak has silver trim with blue runes embroidered on it. A pair of thick leather boots adorn his feet and as worn as they are its easy to see they are well made and cared for. His weapon of choice is a weighted spear, a staff with a spear head on one end and a thick metal ball on the other like a mace. Its shaft is made of black wood with traces of grey in lines spiraling around it, from the spear end there are bones, and bits of fur dangling. Baron seems cold when you first meet him and often has more respect for the dead than the living. He gives off a cold creepy vibe but if you can get past that he's not a bad guy and strives to make the world a better place with his actions. People would likely call him a hypocrite if they knew he practiced necromancy but his respect for the dead is for the soul, which has passed on to be judged by the spirits, not the body left to rot in the ground. That being said he will not abide people using the bodies of the dead for evil purposes....like smuggling. Baron is a caring person to those who he calls friend and would do everything in his power to ensure there safety, indeed this extends to those he doesn't know if they get in a deadly situation. Baron had what he considered a normal childhood, as normal as you could being raised by a grave keeper and medicine women anyway. His older brother was training to join the guard and Baron would often follow him and watch all while writing notes in his book that he kept with him at all time. Dreek, Baron's older brother, often ate more than his share...taking Barons' portion sometimes which caused Baron to develop oddly. He wasn't as strong as normal kids but to make up for this he noticed more and could often point out problems in his brother's fighting styles before the instructor could. People called him gifted to his face and strange when his back was turned. His sunken complexion and thin body was unnatural for a dwarf and caused some to ridicule him. As he grew he found himself taking walks through the graveyard and out the back into the forest and that's where he would let his frustrations out where no one could hear him....or so he thought. One day after venting about losing an apple to Dreek a voice on the wind spoke to him. While this would have frightened most people Baron found it fascinating. After many days of conversations he learned that the voice was the spirit of bone, a keeper of the dead and undead. It guided Baron with advice, though Baron didn't know why, and showed him the ways of magic both benevolent and malevolent and how they could be used to make the world a better place. Soon Baron was gone so often that his family began to take notice and Baron knew that he was going to have to tell them when he was asked about where he was going. Baron went to the window and opened the shutters giving a call and a few moments later a being of floating bone coated rock came through. His mother gasped "A spirit." his father looked confused, his brother drew a weapon, his sister just smiled. Baron explained that he had been conversing with a spirit of bone and was given this creature, named Malask, as a guide. It took an hour or more of explaining to get his father to understand, though his mother understood and accepted it without much question. The next few years Baron was guided by the spirits. They guided him back to the forest one night, telling him that he was in danger. Puzzled Baron sat in the forest for hours trying to figure out what they meant before heading home. When he returned home he found his house on fire and surrounded by guards. Baron screamed when he found out that his family had been attacked by undead, the guards had found his brother and father dead and being eaten by zombies. There were so many undead that in order to protect the town the guards had locked the doors and set the building ablaze. Tears filled his eyes as he fell to his knees watching the flames but the spirits assured him that all was as it was supposed to be and that the pain would subside in time. The spirits had never lead him astray before but he gave himself the time to watch as the flame ate everything that he knew. Dawn brought the end of the flames and a new Baron. After vanishing from the town for several weeks, where he was communing with the spirits, Baron returned on the day of his birth. Now the age of twenty he was forced to become an adult long before a normal dwarf should. He spoke to several people in the town, including the mayor who was dreading not having someone to dig graves, and set himself upon the path of work his father did. The mayor was so grateful, and sorry for Baron's loss, he had a small home built near the graveyard. The next twenty years flew by as Baron tended not only the graves but the spirits of those who needed help moving on. During these years he made a few friends, and some enemies but he knew that he needed to stay and tend the grave....even if he didn't understand the reason why the spirits would want this of him. Last edited by Rylus; 01-04-2019 at 02:15 AM. How do you feel about the Occult Rules? They're a long-time love of mine, but it's hard to find people willing to deal with some of their peculiarities. I'm not planning on diving hard into complex stuff like leylines or Occult Rituals, but some of the mental stuff would be involved (thinking some form of Psychic). Last edited by Master of Monsters; 12-30-2018 at 05:14 AM. It's literally just a heading on the d20pfsrd.com site, too. Scroll down and you'll see the "Occult Classes" section. Essentially just an alternate casting dynamic, focusing on emotional and mental stuff rather than divine/arcane. I very recently just got into Pathfinder and I love the whole open-world fleshed out feeling it has. I'm definitely looking for more games, so count me as interested! I think I have a character concept in mind for this one, so I'mma start working on that! Description: Muinor is slightly taller than the average elf, and a lot bulkier in terms of meat on his bones, but despite that, he's very agile and quick on his feet. He has black hair that goes down to to his upper back, split at the sides to reveal his characteristic ears. He's distinguished quite easily by the tattoos on his face, a mark of honour for him since it signifies he was part of a special operations unit in the elvish military. He has little scars on his face, but a few on his upper body and one scar along the length of his upper right arm from a sword. Muinor wears simple gear, standard studded leather armour from his time in the military, a hooded cloak, and sparse else. Personality: Muinor is a calm and collected individual. It takes a lot to shake him, and only a few things in his life have shaken him to any significant degree. He is the type of elf with a constant smile on his face despite all the hardships he faced, believing wholeheartedly that whatever happens will eventually work out. Because he's going to fix it and make it better. He takes things in stride, and because he's lived for so long, events don't usually have much of an effect on him. Many see him as aloof because of this, but it's simply because he knows in time he will either get past it or it'll find a way to fix itself. He is also the type of person that's very traditional and old-fashioned. Elves, although very traditional due to their long lives, are slowly beginning to change due to the climate around them, and Muinor is adamant that he stick to the old elvish practices he grew up on. Rituals that he knows are meaningless, but give him a sense of purpose and grounding are paramount to him. Many would also say that he's somewhat apathetic, but that's simply because he's reserved. Having grown up and raised around elves, they value composure and poise more than the expression of emotions, and often see the expression of high emotions in public as rude and a sign that one lacks self control. These traditions and ideas are instilled deep within him, especially since it's so closely upheld in the elvish military where one cannot show anything except a passive face to their officers. To his personal friends and those he considers brothers and sisters, he is far more loose and open with his emotional expression, smiling freely and even willing to cry in front of them. Otherwise, even when he jokes, he offers little more than a simple smile. Muinor was born in the Elf city Neeth Themar deep within the High Forest. His childhood was uneventful, having grown up as other elf children did: running around through the streets of the city under the watchful eyes of their elders. At the age of seven, like many elf children, he was taken away from the city and left under the care of a Surrogate Family in deep in the woods. A custom to teach children the harshness of life and to fend for themselves. There, Muinor was expected like all children to hunt for himself and make his own food. It was difficult at first, the bow awkward in his hands, and his feet making too-loud noises with every step he took, but through the course of years he slowly began to learn. The Surrogate Family also taught him how to hold a sword and how to defend oneself from an attacker. And although the likelihood was little, the knowledge was instilled within him and his Surrogate siblings nonetheless. Through the years, their awkward sword strokes and hunting skills began to get better, until they were like shadows when hunting and their swings were practised as well as any fighter. And as his skills grew, his life became easier with the Family, and hunting became second nature to him and his Siblings. It was only then that he was allowed to return home at the age of forty six, still a teenager by elvish standards. 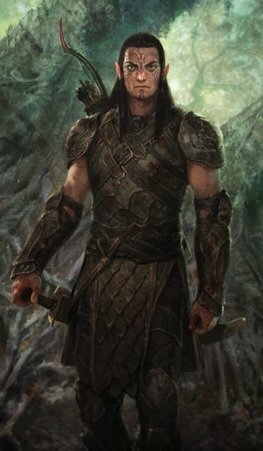 Upon returning, he helped his father with his merchanting venture for a few years before a sort of wonderlust took hold of him at the age of eighty four, and eventually he signed up to the elvish military within the High Forest. Training was difficult and prolonged, often the drill sergeants pushing him and his fellow trainees to their limits. He was often sleep deprived, a feeling he'd never before felt; he was starved, and put through rigorous training courses under such conditions. He pushed himself, with the thought that if one could do it, what prevented him from doing it as well? And with that mindset he managed to impress an officer from the Thrangail Corps, a spec ops division of the elvish military. He was taken through a minor training program, and soon after, he was inducted into the corps. Thrangail, roughly translated to common, meant to shield or protect, and so that's exactly what the division did. They watched the borders of their land, and oversaw the merchants that would enter their forest, watching them without being seen. He was trained in subterfuge should the time come where they were needed to go behind enemy lines, and his weeks were filled with patrols and running drills. As time went he began to get comfortable in his position. The drills were tough and hard, challenging and meant to push him and grow his limits for any possible eventuality. A hundred years passed without incident, and during that time he was often allowed to go back and visit his family. Things began to change quickly soon after however. Human bandits began to increase in number outside the fringes of the the High Forest to the North, leading to merchants coming from the north west to avoid going into forest altogether. A sudden drought in resources one season drew the attention from the elf nation's higher ups and they tasked Muinor's squad to investigate. It was the first time he travelled outside elvish territory by a significant degree, going all the way to Silverymoon. They embedded themselves within the city, a contact teaching them the local dialect and elvish slang to help them fit in. They spent the next few years digging around, and found that an elf merchant had disrespected a powerful lord within the city and he set a group of bandits to block their trade routes. Muinor and his squad returned with the news and he heard that an ultimatum had been set for Silvermoon a year later. To either fight the bandits off or the elves would sanction all trade from reaching the city. Silverymoon responded with false promises and vague assurances, but over the course of fifteen years the bandits slowly began getting more and more aggressive, even attempting to cross into elvish territory. Orders promptly came down to set up roadblocks leading to Silverymoon and turn merchants heading towards the city away under threat of assault. Meanwhile, Muinor and his squad and a few others from the Thrangail Corps infiltrated the city once more to remove the lord and replace him with another that was more sympathetic with their cause. After twenty years, with several clashes between Silverymoon and the High Forest elves, the city relented and elvish nobility entered the city and established themselves within to keep a watch on the city. Muinor and his squad were ordered to return to the High Forest and keep watch on their borders. During one of their watches, a half-elf merchant walked mistakenly into Thrangail head quarters, an offence that would have seen anyone killed on the spot. However, Muinor who was keeping watch at the time, told the half-elf to go back and forget the place existed. The mistake led to a covert assault on the base, and with most of Thrangrail in Silverymoon, the elves could do little to defend their base. Many of Muinor's brothers and sisters were slaughtered in the assault, and although they tried to keep the enemy engaged and entrapped until reinforcements could arrive, they managed to flee. Muinor was dishonourable discharged, bringing shame to his entire family. However his superior officer, instead of allowing an honourable suicide, told him to seek his honour elsewhere in the world as a sort of punishment, knowing that Muinor would have trouble living with the shame and guilt. He now seeks to bring honour back to his family and ancestors through his deeds. Last edited by Torack; 12-31-2018 at 05:12 PM. Lastly, what level do you plan on reaching with this? I love Psychic, but it really doesn't hit it's stride until around lvl 7.